We were both watching him unravel slowly on the sidelines. He faced the opposite wall so no one could see. I could feel his body tense from across the court, and feel the tears welling up in his eyes. His worst fear had just come true, he had shot a basket, and scored. As a result the bleachers erupted in cheers. 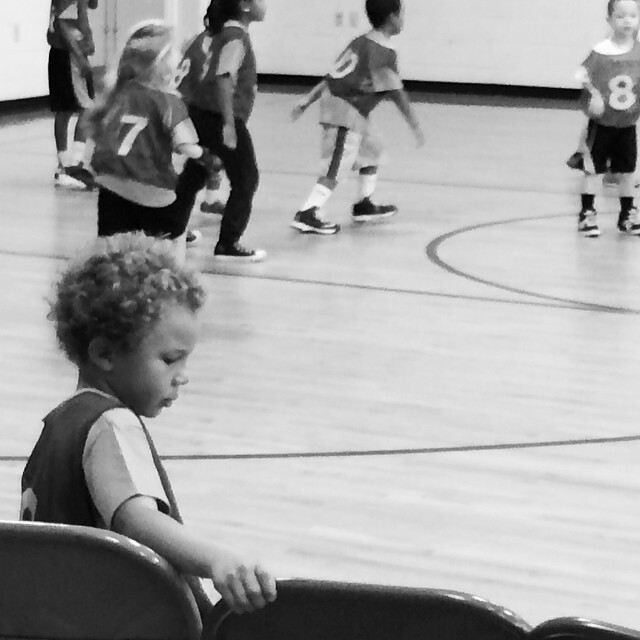 This is what happens when you are six and playing on your first basketball team, for your first game. People cheer. This is painful to my son. Reconciling his love of basketball with his loathing of attention is his challenge. Watching him experience it, and ultimately survive it on his own, is mine. But unlike Marcel at that moment, I wasn’t alone. Shrek was right next to me watching it unfold, and noticing my body tense with his. “This is incredibly hard for you to watch isn’t it?” Perhaps this seems obvious, but for me to be witnessed in the process by a partner who can take in all these layers of struggle is amazing. It is also hard for me, because I am you may recall a super hero single parent who does perfectly well on her own. “I can’t go up to him right now can I?” I asked him. “No way, ” he answered without hesitation. I called Sam over from playing with his friends, and asked him to just check in, by sitting next to Marcel for a moment while his squad was not playing. His little brother was now slouching in the chair and clearly distraught. We were all of five feet away. 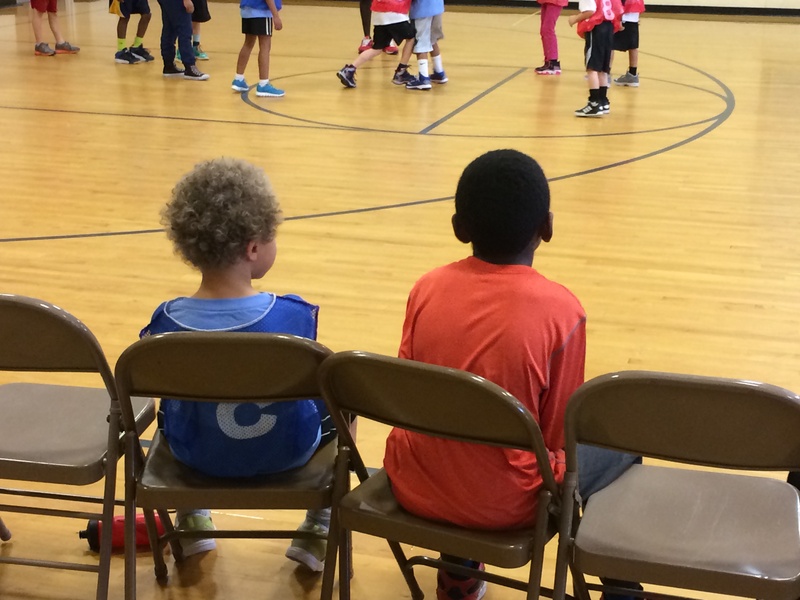 “Got it,” Sam said, and climbed down the bleachers, and gently sat next to his brother. In seconds Marcel was sitting up strait and talking about who knows what with Sam. Magic. “That was a great move. You’ll do a beautiful job helping Sam see why he was so important to Marcel at that moment. Good work Mom,” Shrek offered. While this may sound worthy of praise and celebration, Shrek and I have worked so hard to arrive here, and while it is getting easier and more satisfying, finding a co-parenting middle ground has been some of the hardest work I have ever experienced. For example, a few nights before that Sam was bawling because he insisted that he did not need to correct his homework. Shrek insisted he did. Sam sat at the table defeated and beside himself. I was at the counter cleaning up the dishes wanting to swoop in and rescue him for sure. Then, he looked at me with these huge watery eyes as if to say; “HOW COULD YOU LET THIS MAN DO THIS TO ME? YOU HAVE ABANDONED ME!! !” It was all I could do not to leap across the room, tackle Shrek and yell; “Run!” to Sam. I mean who cares about accuracy? Since when was checking your work that important? Who needs math?” Instead I scrubbed the pan really hard. When I looked over at Shrek imploringly, he said; “I can handle Sam being upset here. Let me deal with it.” At that Sam was done. Exit stage left. About half an hour later the boys were in bed, peace was restored, and no one was broken in pieces on the floor. “Do you hate me?” Shrek asked walking quietly up to me. Shrek just listened. In the silence nine years of my parenting patterns with Sam rolled over and tried to get back to sleep. What business does he have trying to help me become a better parent? The nerve. This is such truth. The attention you give to these choices opens up new paths for all of you. Your family is adapting, growing, becoming richer along the way. What a gift. Thank you for the honesty. The hope, too. I love hearing that others feel and read hope–THANK YOU. What a beautiful story of co-parenting mama and of love between all of you! Such nice boys you have!! Thank you–“nice” is not how I describe them all of the time 🙂 but they are working their way on the path well for sure. I just wanted to let you know that this post really touched me. I’m a single by design mama to a nineteen month old. I’m hoping to bring a co-parent in at some point, and it’s such a tender navigation. Reading about your experiences I feel inspired, and frankly, scared. Thank you for putting it out there. You are so welcome. Thank you for chiming in! It is SCARY and then more scary. And worth it all. I am growing so much. So, so, much.